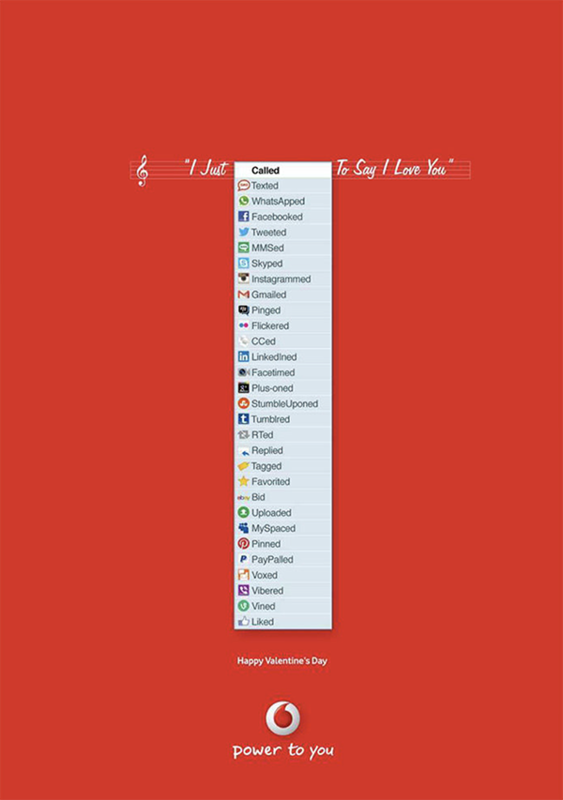 With Valentine’s Day around the corner, we’ve taken a look at some of the best Valentine’s Print campaigns, from the cute, to funny, to the risqué. Many think print is dying out due to the rise of digital media, however, there’s plenty of research to suggest that print is still very much alive and is a great marketing resource. For example, a study discovered that, as well as increasing positive feelings toward a brand, some print ads can even be impactful enough to implant a false memory in the brain. Another study showed that brand recall was 70% higher in participants reading print compared to digital. Neuroscience research shows that paper-based content and ads offer special advantages in connecting with our brains with print advertising offering maximum sensory appeal. Print offers the ability to deliver rich, vivid images along with tactile stimuli. This Netherlands ad from 2013 is in keeping with the times and plays on the popular song. It’s a clever print ad for the telecommunications brand as it offers options that are available on smartphones which are a key product that Vodafone sells. The British mobile phone retailer prides itself on helping consumers save money by comparing mobile phones and networks. They guarantee unbeatable prices and great deals and this UK advert from 2014 lives up to brand values. Valentine’s Day need not be expensive if you follow this advice from Carphone Warehouse which helps you save money, one way or another! Interestingly, both the Vodafone and Carphone Warehouse ads get their point across without even showing their products. Another print ad that doesn’t feature the brand’s product is this Andrex advert from 2016. It pulls at the heartstrings with the adorable Andrex puppy in a lovely heart of roses – mixing its brand with the season of love. 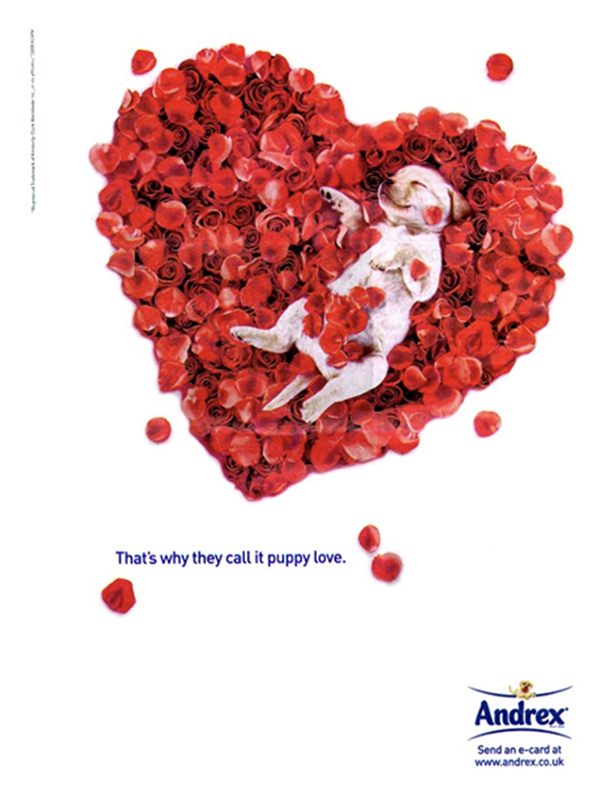 Andrex also cleverly plays on the ‘puppy love’ saying in this ad. 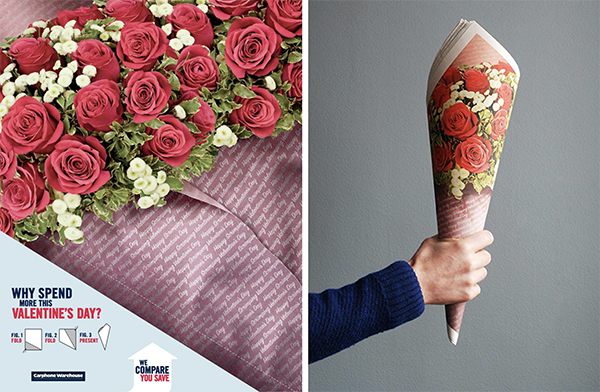 This 2013 advert from Hovis, cleverly uses their product on one of its Valentine’s posters. 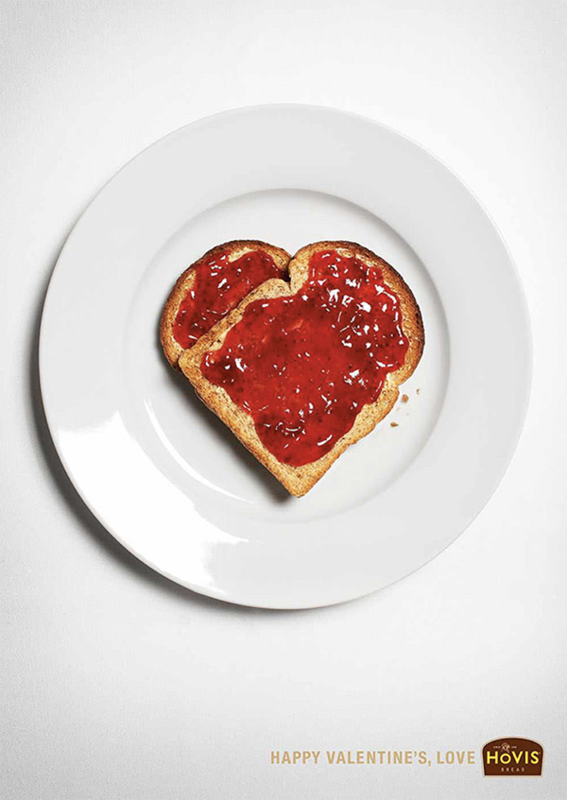 However, it really works as jam on toast, which as many know is a popular British dish! By forming a heart with the bread, it’s simplistic, but effective enough, so that there’s no doubt that this is for Valentine’s Day! 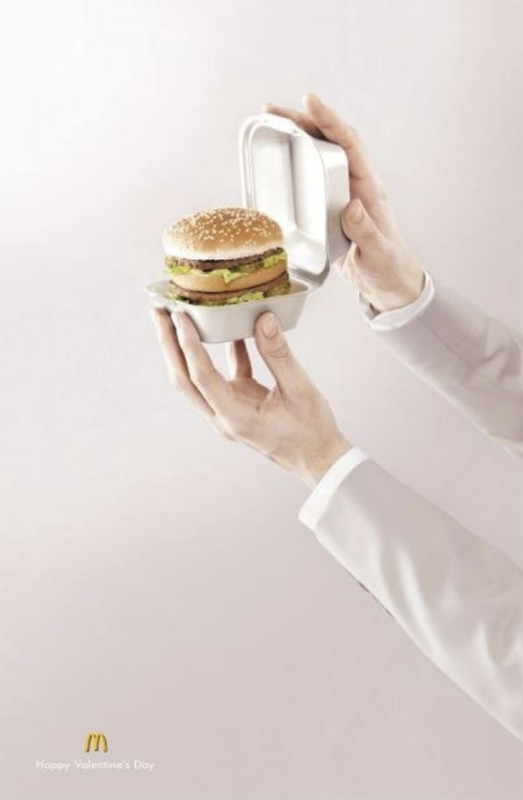 This not-so-romantic offering from McDonald’s was shown in France and plays on an engagement, but using a McDonald’s Product. Well, it could be considered romantic to some, if they love McDonald’s as much as their significant other! 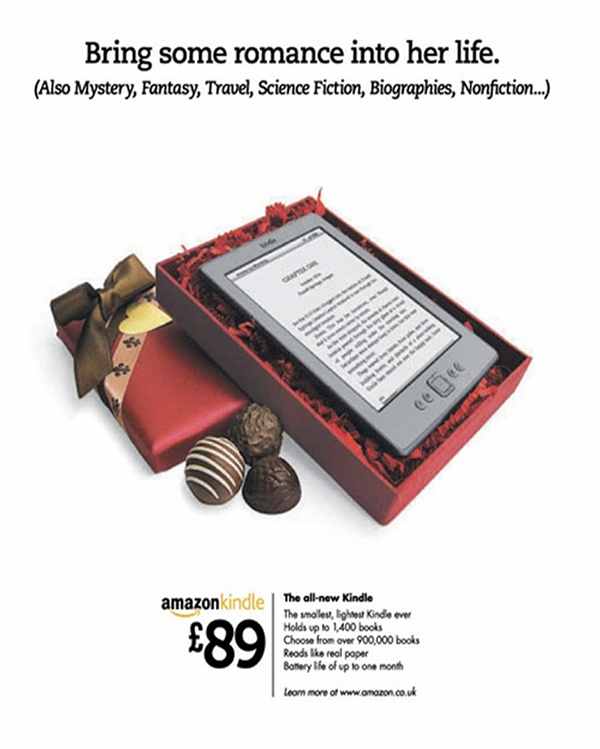 Amazon has perfectly married Valentine’s Day and its ever-popular Kindle by portraying the gift as a romantic gift. The global brand has also used the romantic fiction genre to sell the product which perfectly links to Valentine’s. There’s always the brands who want to take their print ads to the next level for Valentine’s Day and produce a risqué advert. 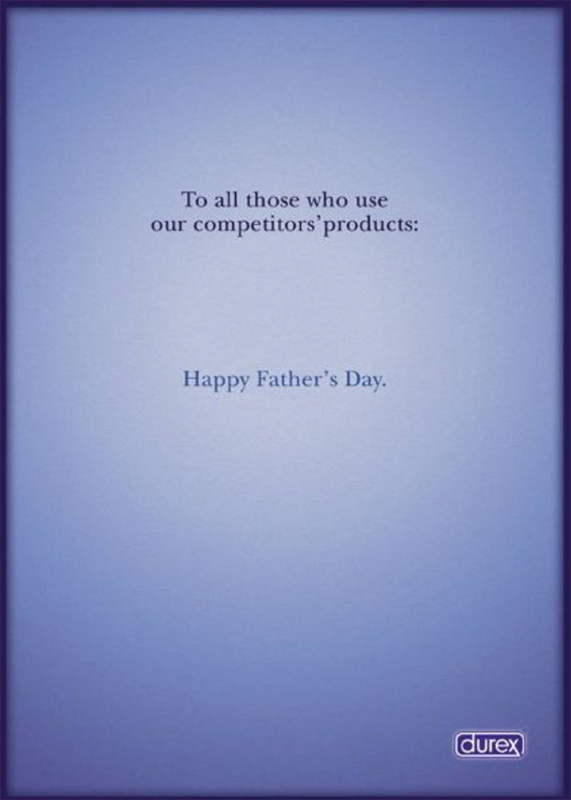 A cunning ploy by condom brand Durex to advertise their products around the season of love… if you know what we mean! 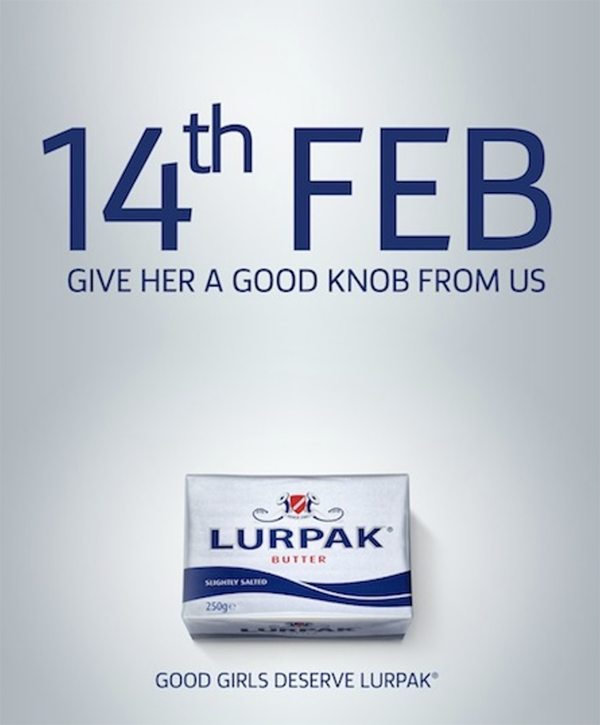 Lurpak’s tongue-in-cheek ad has meant we’ll never look at Lurpak in the same way again! 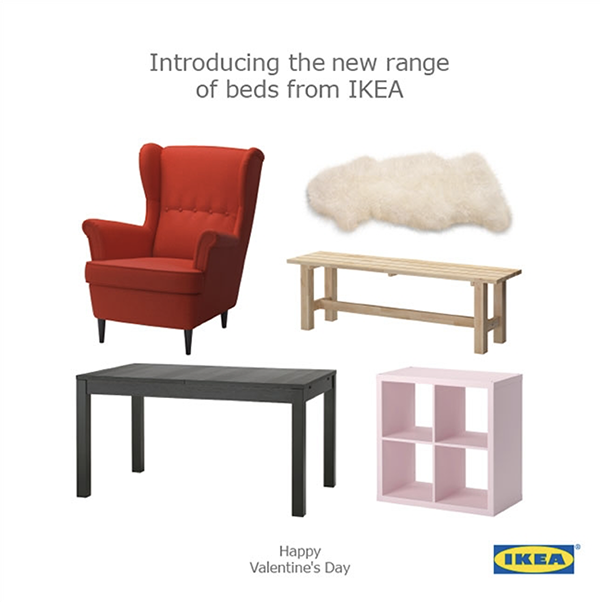 Ikea showed off its new range of beds in a cheeky Valentine’s Day ad in 2015. Clearly, these beds are not for sleeping! So, there we have it, some of our favourite, and downright suggestive Valentine’s Day ads from years gone by. With print very much alive and well, if you’re looking for an exceptional print service, don’t forget to get a quote with us by filling out the online form on our website, or by contacting: howdy@printshop.uk.com. Make sure you follow us on Twitter to keep up to date with our services and the latest print news.